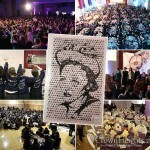 CROWN HEIGHTS, Brooklyn [CHI] — Over 1600 high school girls from throughout the world are expected to gather this weekend in Crown Heights for the annual Chof Beis Shevat Inter-School convention titled “Prepare For Landing.” Bais Rivkah of Crown Heights, the flagship school of the Lubavitch Educational network for girls, is hosting the convention for the over 22 participating schools arriving from locations throughout the world, such as Sydney, Chicago, Worcester, Florida, Canada, London, New Haven, Manchester, Seattle, Los Angeles, Pittsburgh, and many others. 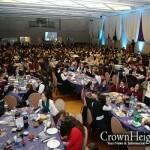 The packed convention schedule includes inter-school farbrengens, Friday Mivztoim, an exciting Game Show competition on Hayom Yom, A Chidon where finalists from participating schools meet to match on the subject of Moshiach and Geulah, and a viewing of the annual Bais Rivkah High School Production. For the first time ever Bais Rivkah and Bnos Chabad will be hosting the Banquet at the Ohelei Torah Ballroom Sunday night at 6:30 SHARP. The annual B’nos Chabad convention is highly anticipated throughout the year by all the students who attend; the atmosphere is always permeated with a tremendous sense of achdus and pride, and the feeling of ashreinu ma tov chelkeinu is remembered by all for a long time. convention is amazing this year, and TORONTO is the best school!!!! so lets let me hear you cheer!!!!!!!!!!! T-OR-T-O-R-O-N-T-O!!!!!!!!!!!!!!!!!!!!!!!!!! i am gonna miss u all! convention is so much fun!!!!!!!!!!!! it was soooooooooooooooooooooo much fun@!!! awesome!! beautiful!!!!!! !